A research report by Edmund Tie & Co (ETCSEA) said the property curbs by the Government has not dampened the foreign investor demand for private residential properties. It said that the increase in Additional Buyer’s Stamp Duties (ABSD) and tightening of loan-to-value (LTV) limits acted as a deterrent to Singapore Permanent Residents (SPRs) and Non-Permanent Residents (NPRs), as home purchases by them reduced by 26.4 per cent and 17.9 per cent q-o-q to 754 and 307 units respectively. The report said that while the revision in ABSD does not affect SPRs purchasing their first residential property, the cooling measures may have reduced foreign investor demand, both from from SPRs and NPRs. After the property curbs, the proportion of SPR buyers reduced to 14.8 per cent while that of NPR buyers remained largely unchanged at 6.0 per cent. The report said that projects that were popular among Singaporeans were also favoured by SPRs. These include Riverfront Residences, Stirling Residences, Park Colonial and Jadescape, which were among the new launches in Q3. Besides being popular with Singaporeans, these suburban projects are priced competitively, and hence commanded foreign investor demand as well. ETCSEA report said that besides the competitive prices of new launches, NPRs favoured developments that are either in prime areas or near to the Central Business District (CBD), which is shown from the inclusion of Marina One and Martin Modern in the top five selling projects for NPRs. Some 15 units at Martin Modern were sold to NPRs, comprising 51.7 per cent of the total transacted units at the development at Martin Place in Q3. Out of the four major foreign nationalities of non-landed homebuyers, the cooling measures deterred the foreign investor demand of Indian purchasers the most, said the report. Their purchases declined by 49.2 per cent q-o-q to 61 units in Q3. Acquisitions by mainland Chinese nationals fell by 37.6 per cent q-o-q to 291 units while that of Malaysian buyers decreased by 28.1 per cent q-o-q to 197 units. Due to the cooling measures, foreign buyers have become even more price-conscious in their purchases. 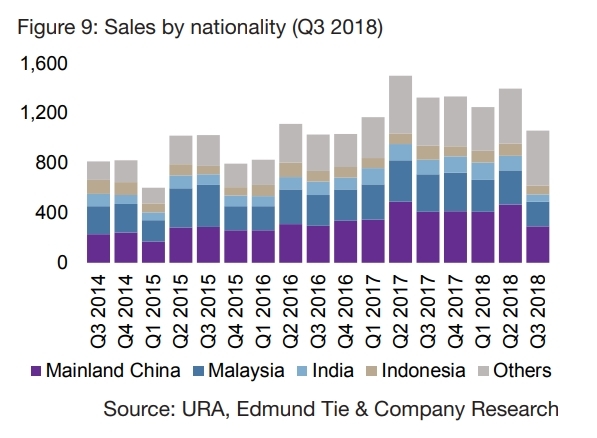 “For instance, there was an increase in proportion of purchases made by the Malaysian and Indian buyers that were priced below $1.5m, from 72.8 per cent and 62.8 per cent in Q2 to 81.7 per cent and 70.5 per cent in Q3 respectively. 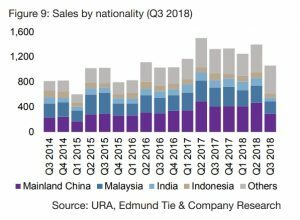 For the mainland Chinese, who remained the largest proportion of foreign buyers, saw a decline in proportion of acquisitions priced below $1.5m and above $5m, from 66.7 per cent and 7.9 per cent in Q2 to 64.3 per cent and 6.5 per cent respectively in Q3. The report added that despite the curbs by the Government, the local residential market remains attractive to foreigners as Singapore continues to be a gateway to the ASEAN region, attracting foreign companies to relocate or set up their operations here. The ETCSEA report noted that the new cooling measures dampened sentiments in the private residential market, as collective sales came to a halt and residential sales became comparatively lacklustre due to the curb of investor demand. It said that going forward, demand for residential properties will likely come from first-time buyers and displaced owners looking for replacement homes, who are less affected by the cooling measures. It also noted that notwithstanding the cooling measures, there were no significant price discounts for new launches, and developers chose to focus their marketing initiatives on unique attributes of the projects instead. This has resulted in relatively healthy take-up rates of the projects that were launched after the cooling measures took effect. In October 2018, the Government announced the revision of guidelines to private residential developments. One of which was the increase in minimum average unit size from 70 sq m (753 sq ft) to 85 sq m (915 sq ft), and 100 sq m (1,076 sq ft) to nine areas, with effect from 17 January 2019. ETCSEA said that this would cause developers of upcoming launches to focus on selling the smaller units, which are generally popular with investors and young families who have lower capital outlay. It added that in the upcoming quarters, various large developments (more than 1,000 units) are expected to launch – which besides providing discerning buyers with a variety of choices, will also keep foreign investor demand intact.